Brown short hair beast legs with additional longer hair on the front of the pants to give a more beastly appearance. 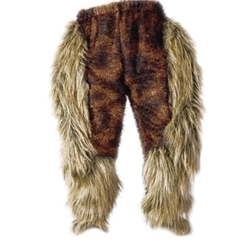 These pants can be used as part of the beast costume from Beauty and the Beast or to create other human-animal hybrid costumes. The brown beast legs has an elastic waist that fits up to 48”, Velcro closure at the back of the ankles to adjust the length, and foam inserts to give them a more animalistic look.